Enterprise Florida, the state’s job-recruiting arm, will introduce the new campaign at its board meeting in Tallahassee. The new state business brand was fast-tracked, as Enterprise Florida quickly sifted through dozens of potential advertising agencies and, later, dozens of storyboard campaign ideas before picking one. Bill Johnson, Enterprise Florida CEO, had promised he would deliver a new chief marketing officer and a new state business branding campaign within his first year at the helm. With the hiring in October of Tampa Bay marketing veteran Joe Hice, formerly with the Moffitt Cancer Center and the person who led the team that created the University of Florida’s “Gator Nation” brand, Johnson is honoring his own timetable. What it will be is a campaign that combines, after all the vetting, the surviving two ideas pitched by Jacksonville ad agency St. John & Partners, whose clients include the Florida Lottery, Zaxby’s and the Daytona International Speedway. “There’s an urgency to get out there with the Florida story,” Hice says, “and to tell that business story over and over again. The campaign’s slogan was “Florida. The Perfect Climate for Business.” But it featured people wearing orange ties, which felt dated and alienated some businesswomen who felt it was not inclusive. And too many of the visual scenes in the campaign featured Florida sand, which many business leaders criticized for sending the wrong message —that the state was still a place dominated by tourists and retirees. The new campaign has more clout, backed by $10 million approved by the state Legislature. It includes $8.5 million in recurring funding, to help maintain the campaign over time — an unusual commitment for Florida’s here-today-gone-tomorrow funding style. 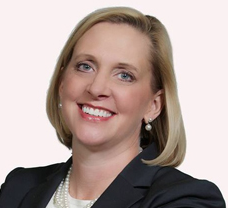 Enterprise Florida names new SVP & CMO and it’s Me!!! ORLANDO, Fla. (October 6, 2015) – Today, Secretary of Commerce and President & CEO of Enterprise Florida, Inc. (EFI), Bill Johnson, announced the appointment of Joseph S. Hice Jr. to the position of Senior Vice President & Chief Marketing Officer for EFI. Hice will oversee all EFI marketing and communications activities. Hice has spent more than 30 years as a marketing, communications and public affairs executive at prestigious institutions and businesses including the Moffitt Cancer Center in Tampa, the University of Florida, North Carolina State University, Harley-Davidson Motor Company and Segway Inc. 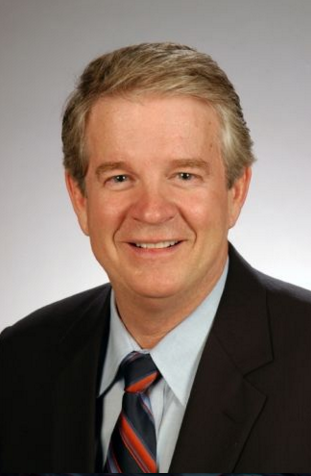 Currently, he is a partner with Tampa-based Well Strategics, a communications firm specializing in clients doing business in the healthcare and wellness industries. Differentiating your university from the hundreds of other institutions you compete against has to be one of your top priorities when it comes to college marketing. Here’s a list of 88 examples of what not to do compiled for fun by the Chronicle of Higher Education. Well, maybe all 88 aren’t horrible, but you’ll get the idea once you look at the list. You’ll note, not a single The Foundation for The Gator Nation in the bunch. Can you guess the institution and the tagline without cheating? I suspect not! Real Life. Real Knowledge. Real People. One Purpose. One Mission. One Dream. The highest GPA for a graduating senior in Hillsborough County this year was 10.43. Wow! The average GPA for graduating Valedictorians was 6.839444. The once elusive 4.0 graduate wouldn’t even make the cut as the lowest GPA posted by a Valedictorian this year was 4.25. I know it’s a different world we live in, but when a student can earn (I use that term loosely) a TEN POINT FOUR THREE grade point average through his or her high school years, we’ve lost touch with reality. So, if 6.8 is the new 4.0, I graduated high school with the equivalent of a 5.282 adjusted for today’s grade inflation. And that, my friends, is just CRAZY. Female Valedictorians outnumbered male Valedictorians 2 to 1. By my quick count there were 30 female winners and 15 male winners. So ask yourself, when a student can achieve a 10.43 GPA and the average Valedictorian earns a 6.8 GPA, is the 4.0 no longer relevant? In 486 B.C., the Ice Princess died of cancer. She was self medicating on marijuana. “I am quite sure of the diagnosis — she had cancer.,” said researcher Andrey Letyagin. The Princess was found buried with cannabis, which she may have used to deal with her immeasurable pain. There is other archeological evidence that the Pazyryk people used cannabis, wine, and opium for analgesic purposes. 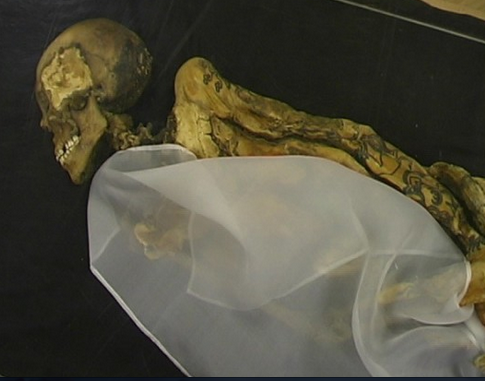 She died of Breast Cancer 2500 years ago. She self medicated with marijuana! Because I may be out of town on election day, I requested and received a mail-in ballot from Hillsborough County. About 150,000 other residents in the county received the same. 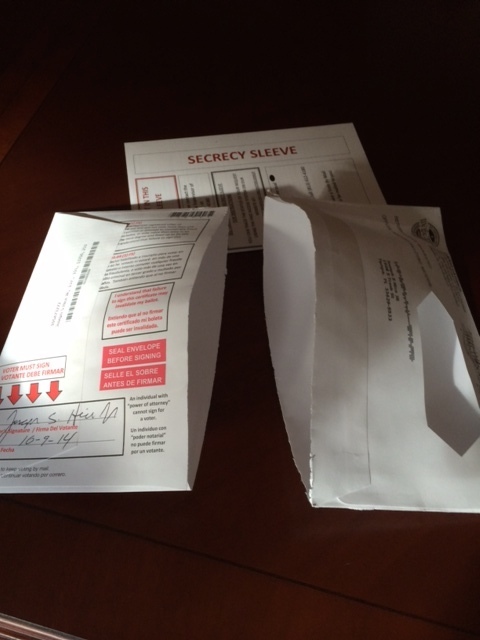 When I went to return my completed ballot, I discovered that I had accidentally sliced open both the envelope the ballot arrived in and the return envelope that was enclosed. I felt stupid for doing it, but I opened the initial letter with my letter opener as I do with all my mail and I didn’t even think about it until I went to send the ballot in. So I’ve gotta ask myself, is there a potential problem with Hillsborough County’s mail-in ballot. I called the Supervisor of Elections office when I discovered the problem and when the clerk answered, I said I had an issue with the return envelope in my mail-in ballot (envelope on left in photo above). The operator immediately asked if I had cut open the bottom of my return envelope. Hey, this woman knew exactly why I was calling so I assumed it must have happened before. I said yes and asked if I could just tape it closed. She said no, the office would have to send me a new return envelope to use, otherwise my vote would not be counted! Say What!!! About four days later the new return envelope arrived and I used it to send in my ballot. So I’m asking myself about all those people who may be waiting until the last minute to send in their mail-in ballots. If they too have sliced open their return envelope there may not be enough time for them to receive a new return envelope and get their ballot mailed in before the election deadline. That means they loose their opportunity to vote in what may be one of the most important elections in the history of Florida. There are 766,092 registered voters in Hillsborough County and 150,000 of them have requested mail-in ballots. That’s almost one in five registered voters or 19.58% of the electorate. Now ask yourself, how close was the last governor’s race and how close is this election going to be. Right now it’s a dead heat. So yeah, it’s gonna be close. If just 10% of those receiving mail-in ballots discover a problem with their return envelope (like I did) that’s 15,000 votes. And if just 10% of that group are unable to vote because they do not discover the problem with the return envelope in time, that’s 1,500 votes. A small number, but enough to affect an election. Now if more than 10% have a problem with the return envelope, the issue gets even bigger. Then again, there may only be a handful who sliced open both envelopes . . . like I did. If you or anyone you know plans to vote early using the mail-in ballot, make sure you are careful when you open the envelope. 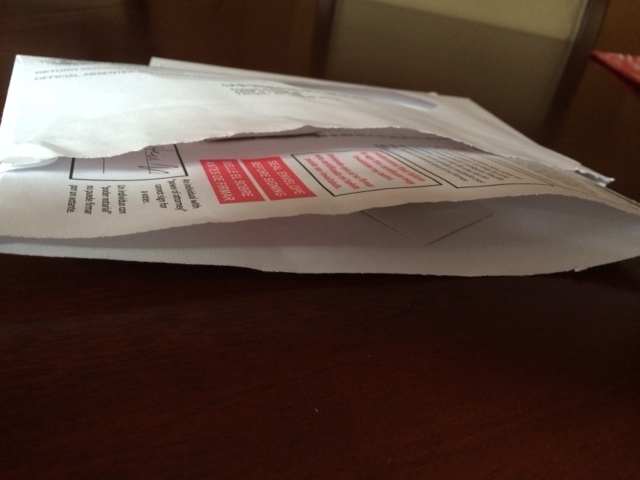 You don’t want to accidentally slice open the mail-in envelope that is inside along with the ballot. If you do, you’re vote may not count. Hey, you may not be able to vote at all. 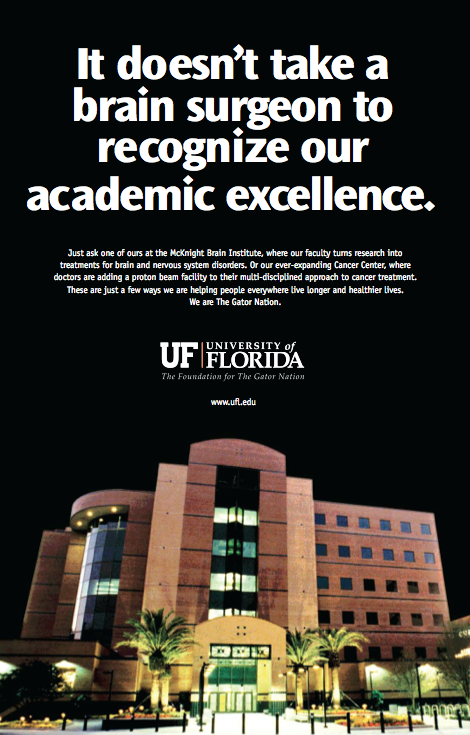 The University of Florida is The Foundation for The Gator Nation. That is the University of Florida’s brand. In my opinion, it always will be. Probably always has been. All this talk about rebranding is just promotion by the local advertising agency hired to create a new tag line for the year. And as all good marketing and PR students know, a brand is not a tag line or theme. It’s much, much bigger than that. 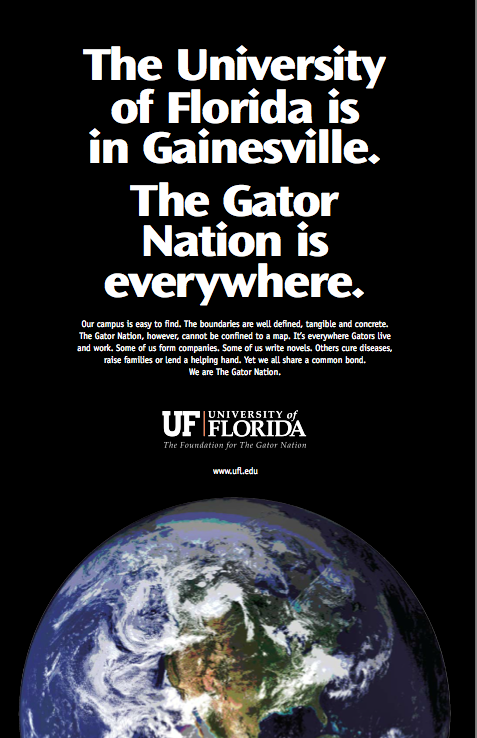 So when we created The Gator Nation campaign back in 2005, our first television commercials challenged people to: “Go Start a Fortune 500 company. Go write the great American novel. Go cure cancer. Go to Mars.” Wasn’t the idea then to inspire others to come together and solve some of the world’s most pressing problems? I probably am overly protective of the UF Brand, but even after nine years, The Gator Nation campaign still feels like my baby and I’m going to look after it. Rebranding, not on your life. 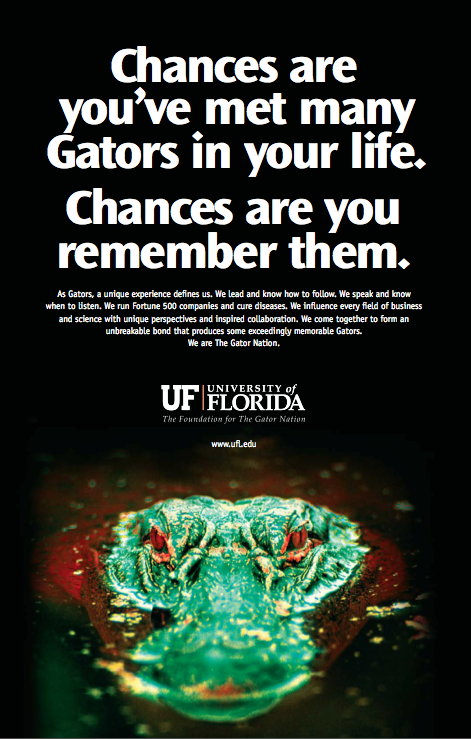 A new tag line for sure and “For the Gator Good” is a good one, but it is not a rebranding effort and the university and its new agency should stop talking like that. It makes them look dumb, and I know they are not. It also confuses those who embrace The Gator Nation. If The Gator Nation is not our brand, then what is it? So sad to learn that Karen Bricklemyer has died. Seems so unfair. You did good Karen! Rest in peace knowing the world is a better place because of you. In 2007, in-state tuition and fees at public universities around the country ranged from a high of $12,164 a year at Penn State to a low of $3,206 at the University of Florida. You read that correctly; Florida had the lowest in-state tuition in the country. The national average for tuition and fees was $5,838. That’s why the Florida Legislature gave schools like UF, FSU, USF and UCF the ability to increase tuition up to 15% a year until they reached the national average. The Governor signed the legislation after research at each of the four universities showed even students overwhelmingly supported the increases. The students went so far as to caravan to Tallahassee to lobby for the higher tuition. Why would students encourage higher tuition? Good question, but Florida students aren’t stupid. They recognized that a Wal-Mart-quality Education (aka … Cheap) would not help them get jobs following graduation. And at $3,206 a year, that is where higher ed in Florida was heading. Today that average tuition and fees in Florida is $6,336. The national average is $8,893. So tuition in Florida is still $2,557 — or 28% — below the national average. And Florida still only has one public university in the Top 50. We need an open and honest discussion of the issues. 10.02 GPA — Can you say Grade Inflation!!! Throughout higher ed circles, the topic of grade inflation is a popular one. How can a student at one school graduate with a perfect 4.0 GPA while a student at another graduate with an imperfect 10.02. That’s right, 10.02 and she got a “B” somewhere along the line. While I’m sure the students worked very hard to achieve the unachievable, but really folks. I know, I know, it’s because of all the extra credit awarded to honors courses, but come on. Is the 4.0 student from my day (we had only a handful in a graduating class of almost 1,000) less than half as smart as the 10.02 graduate today? It’s important that kids work hard in high school. It prepares them for college. Prepares them for the world. Teaches them to think for themselves. But does a 10.02 . . . or even a lowly 6.82 really do these kids any favors? I think not. We are demonstrating that its possible to be better than perfect. Better than 4.0. We’re setting false expectations for the real world. I know many will disagree, but I’ve got to ask if in today’s world, would my 3.4 high school average equate to 8.517 making me the second smartest kid in Hillsborough County. Yeah, that must be true.